It's been a busy few days. Looking back, it's all a bit of a blur. Lambing has been going well (so far). But I always feel a bit uneasy saying that. We've still got a way to go. The first ewe, call her no.1, is still favouring her ram lamb. I've known human mother's do the same. She's stopped actively attacking the ewe lamb but won't let her drink. The ewe lamb is getting quite good at nipping round the back whilst the ram lamb is drinking. We also hold the mother still to let the ewe lamb drink, and she now recognises us and runs up looking eager when she sees us climbing into the pen. 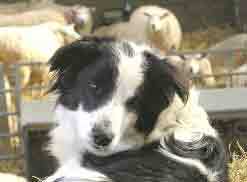 James's mother is very cross with the mother and stands and berates her; but it's not the ewe's fault. It shows the importance of not allowing another ewe to lick a lamb. We had another set of triplets this afternoon. The third one is not yet born here. The third lamb has just been born here, and the ewe looks as though she'd be quite pleased to lose one of them. Earlier this evening we had a single and I managed to foster the largest triplet onto her. We like to foster on a triplet whenever we can as it's more dificult for a ewe to feed 3. The new mother accepted the foster lamb because I smeared it with the fluids from her own lamb, wiping the new lamb over it, and putting them both together under her nose so that she was licking both of them without realising that only one was her own. It seems to have worked, but the foster mother might yet reject the lamb - we need to give it 24 hours to be sure. 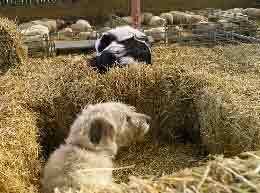 We sit on top of the straw stack whilst having a tea break, and the dogs like sitting up there too. They spend a lot of the day up here, watching everything that's going on - when they're not sleeping.